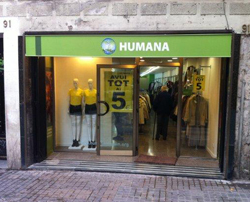 Humana has inaugurated its tenth store of clothing and footwear used in Barcelona. The property is located in Carrer de l’Hospital, 91, in the neighborhood of Raval, near Ramblas. It has more than 250 square meters of retail space capable of holding about 7,000 items, which include clothing and accessories for men, women and children as well as footwear and home textile. On the occasion of the opening, the price of all items is 5 euros.